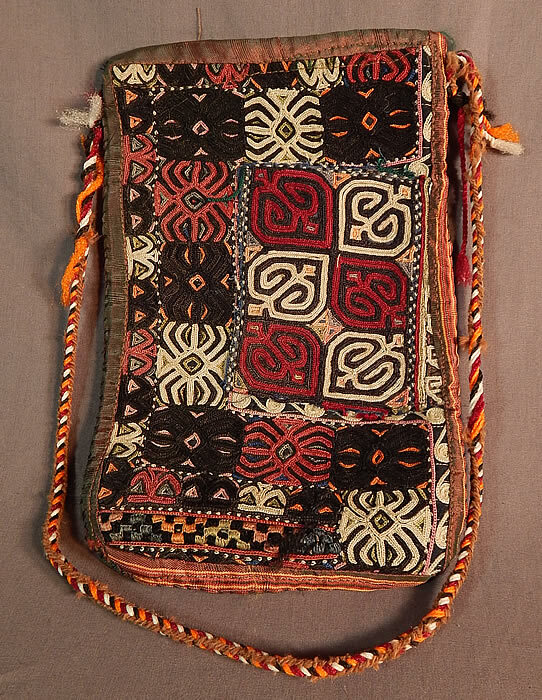 This vintage Afghan Uzbek Lakai embroidery tribal ethnic boho bedouin pouch purse dates from the 1960s. It is hand stitched, made of a patchwork of pieced together colorful chain stitch Lakai embroidery work done in traditional geometric shield shapes. 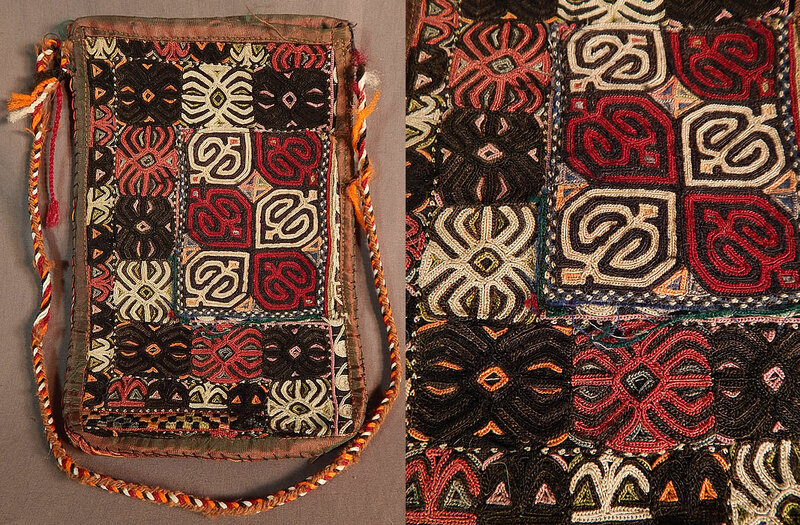 This unique custom made pouch purse bag is a fusion of ethnicities from Central Asia, with Afghan, Uzbek Lakai embroidery on the outside and former Soviet Union Russian red roses floral print cotton fabrics lining the inside. This stunning handmade hand embroidered nomadic bedouin boho gypsy style bag has a colorful braided rope strap, an iridescent silk trim edging and open top with no closure. 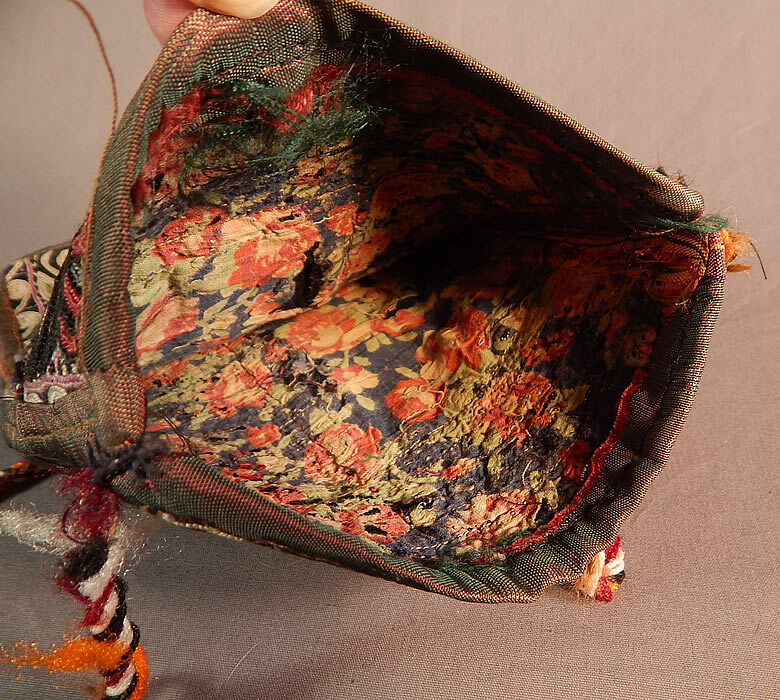 The purse measures 11 inches long and 7 inches wide. It is in good as-is condition, with some wear, fraying in areas and a few small frayed holes on the inside lining (see close-ups). 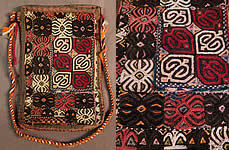 This is truly an amazing piece of Afghani and Uzbeki colorful tribal embroidery boho textile art!